The government of South Korea counts all of its government debt as the country’s national debt. The country also has a number of semi-independent rescue and assistance funds whose debts are also counted as part of the national debt. Economists examine the debts of nations in proportion to those countries’ incomes. The income of a country is called its Gross Domestic Product (GDP), so the most commonly used measurement of national debt is called the “debt to GDP ratio.” The government of South Korea calculated that is debt to GDP ratio was 38.6% at the end of 2017. For the same period, the International Monetary Fund calculated South Korea’s debt to GDP ratio as 39.8%. The core of the debt is the money borrowed by all layers of government through loans and the issuance of bonds. Beyond that, whether the debts of state-owned enterprises, or loan guarantees are included in the national debt figure varies according to the rules that the economists follow. The government of Korea includes the debts of semi-independent funds that operate in the country. Neither the government of South Korea nor the IMF count private sector debt as being part of the national debt. So the debts of commercial banks, companies based in South Korea, or the personal debts of the population are not included as part of the national debt. The headline national debt is also known as the “gross debt” of the country. The net debt of South Korea is a lot lower. This is calculated by adding up the value of all of the financial assets held by the government and deducting that figure from the gross debt. The net debt shows how much the government would still owe if it sold off all of its assets and paid down the debt with the money that it raised. The IMF-calculated net debt of South Korea stood at 6.6% of GDP at the end of 2017. This is a very low figure when compared to the gross debt ratio of 39.8%. This shows that the government of South Korea owns a lot of financial assets, which are valued at the equivalent of 33.2% of the country’s GDP. National Housing Bonds raise money for the construction of homes for the people of South Korea. Although this is a seperate body from the government, the Housing Corporation’s debt is centrally managed. The debts of the Corporation are repaid through the income generated from rents on the properties that are developed. Is South Korea’s national debt rising? South Korea had a very low national debt to GDP ratio of 10% or less throughout the early to mid 1990s. However, the 1997 Asian Financial Crisis created problems for the Korean economy and the government stepped in to expand the economy through debt. The government also had to deal with the 2008 global financial crisis. 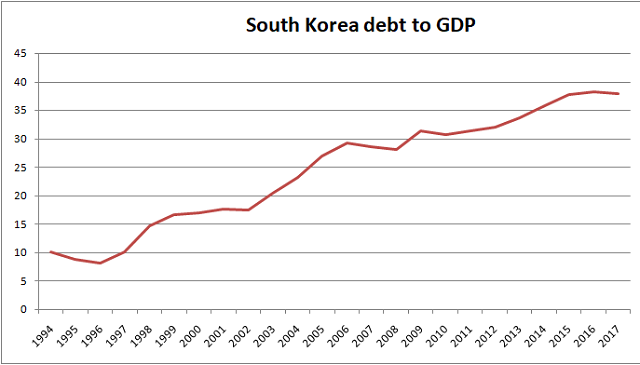 This resulted in a steady climb in the national debt of South Korea, as the graph below shows. The debt to GDP ratio of the country has risen in every year since 1996 except for small falls in 2007, 2008, and 2010. In 2017, the national debt fell very slightly from 38.2% to 38%. As the debt to GDP ratio includes the national income in its calculation, these increased rates of debt occurred over and above the rate of growth in GDP. 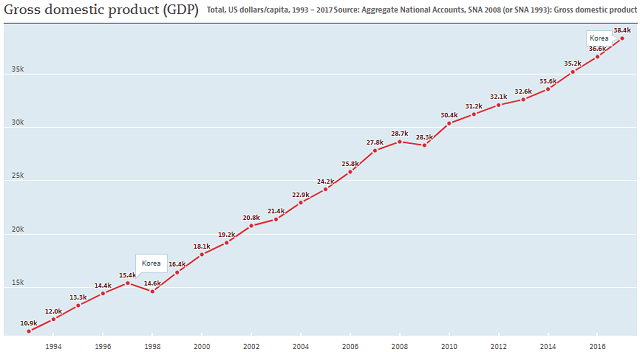 The GDP of South Korea has fallen in only two years over the past two decades: in 1998 and in 2009. The increase in debt rarely comes from central government deficits. 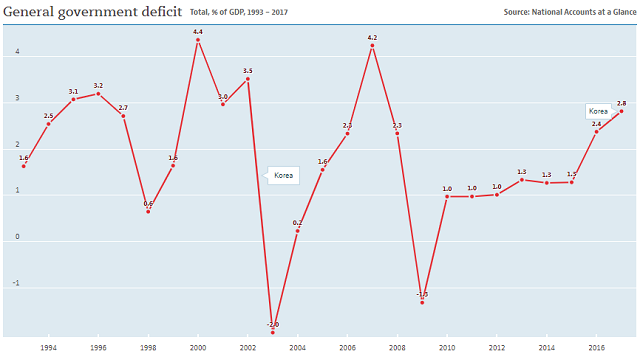 The government of South Korea has only run a budget deficit in two years since 1993. These years were 2003 and 2009. In these cases, the budget deficits were ust 2% and 1.3% of GDP respectively. These are very modest government deficits compared to the deficits run by the USA and many European nations. The rise in national debt comes from other sources, especially the National Housing Corporation. What is South Korea’s credit rating? South Korea doesn’t have the highest possible credit rating, which is “AAA.” However, it’s rating is “AA,” which is just one rung down from triple-A. The country’s debt is very low when compared to over developed economies and the government is in a good position to deal with any future market or banking liquidity problems because it has a very low national debt and could easily borrow more to resolve problems in the economy. The ratings given by the world’s top three agencies are shown in the table below. The “stable” outlook means that one of the credit rating agencies expect the economic situation in South Korea to change any time soon. Who manages South Korea’s national debt? The Ministry of Economy and Finance organizes the government’s annual budget and also has ultimate control over the activities of the National Housing Corporation. The Ministry manages the national economy through the central government budget and its control over other financial and social institutions. All of the actions of the government have to be approved by the parliament. The Ministry of Finance has a Treasury department, which specializes in monitoring the government’s income and also calculates the need for debt. How does the South Korean government raise debt? The Treasury will only sell government securities to a group of authorized buyers, called “Primary Dealers.” The initial issuance of bonds is called the “primary market.” Once the primary dealers buy allocations of securities from the Treasury, they are expected to sell these on the secondary market and make them available for others to buy and sell. There are different ways to organize an auction. One option is “competitive tendering,” where the highest bidder gets all of the allocation that it wants and then the next highest bidder gets an allocation. Non-competitive tendering is also called a “dutch auction.” In this process, the seller keeps accepting bids until all of the issue has been bid for, then all buyers pay the lowest price bid. South Korea created its own auction process for the sale of government securities. This unique system is called a “differential price auction.” All bids are tabulated with the highest offer at the top and all other tenders ordered by decreasing value. The auctioneer then segments this table and all bidders within a segment pay the highest price bid within that group. So, the same bonds are sold at different prices. You can read more about each of these bond types below. Treasury bills do not pay interest. These are short-term debt instruments. The South Korean government offers these with maturities of less than one year. The Treasury usually issues Treasury bills with a maturity date of 63 days. Although there is no interest payable on the bills, traders make a profit because the bills are sold at a discount and redeemed at face value. These bonds are denominated in Korean Won. The government has passed legislation to enable the issuance of floating-rate bond, but none have been issued to date. The KTBi increases in value every year in line with inflation. The bond pays a fixed rate of interest every year, but as the capital amount increases, the actual interest payment works out as more each year. Most KTBis have a maturity of 10 years, but the Treasury has issued some that have longer lifetimes. Before June 2010, KTBs were issued through an auction process. Since that date they are issued to primary dealers at face value on demand. These bonds all have fixed interest rates. NHBs are a very distinctive type of bond that appeals to domestic traders. These bonds are not sold at auction, but are placed with banks on demand. All NHBs pay a fixed interest rate of 1.5% for their durations and all are written with a maturity period of five years. Local government debt is the responsibility of lower government levels, but they cannot be issued at will. The Central government controls how much debt each region can take on and places those bonds on the market in an agency function. What facts should you know about South Korea's national debt? You could wrap $1 bills around the Earth 2,334 times with the debt amount. If you lay $1 bills on top of each other they would make a pile 65,481 km, or 40,688 miles high. That's equivalent to 0.17 trips to the Moon.